← The Tearful Tyrant doubles down. Obama attacks the Constitution, ignores jihadists. Bloodshed in Burns, Oregon. Who to Bless? Who to Blame? It’s finally winding down. The primary ranchers involved in the Burns, Oregon protests were ALL acquitted, and President Trump just pardoned the Hammonds. Fake news persists, but the truth is that the Hammonds were never convicted of anything. They were bludgeoned and intimidated into pleading guilty to a crime they did not commit, and then sentenced as terrorists. The pardon power has its most compelling use when correcting a government injustice. President Trump used his authority on Tuesday for precisely such a purpose in pardoning Dwight Hammond Jr. and his son Steven. In 2011 the federal government charged the two Oregon ranchers with arson and destruction of federal property for having done nothing more than utilize the same fire-management tools that the government routinely employs. The Hammonds had set fires in 2001 and 2006—one to fight invasive species, another to protect against a wildfire. Both fires unintentionally spread to burn nearby public grazing land—139 acres in the first case, a single acre in the second. A federal jury acquitted them of most charges but found them guilty of setting the fires—which they’d already admitted. A federal judge gave them reduced sentences, saying that anything more would “shock the conscience” and be “grossly disproportionate to the severity” of their conduct. We wrote about their case in 2016. The Obama Justice Department, in its usual restraint against its political opponents, appealed and persuaded a different judge in 2015 to impose a mandatory five years each under the 1996 Antiterrorism and Effective Death Penalty Act. Yes, a terrorism statute. The exercise smacked of retribution and coercion, since the Hammonds remain one of the last private ranching families in the Harney Basin. The feds have been on a campaign to drive out private landowners to expand a federal bird refuge around Malheur Lake. In recent years the feds have revoked grazing permits, mismanaged water to let ranchlands flood, and harassed ranchers with regulatory actions. The Hammonds refused to give in to these tactics and ended up in prison. The elder Dwight Hammond, 76, has now served three years, while Steven, 49, has served four. They have also paid $400,000 to settle a federal civil suit against them. The federal treatment of the Hammonds fueled the 40-day citizen takeover in 2016 of Oregon’s Malheur National Wildlife Refuge. That occupation (which the Hammonds did not endorse) was inexcusable and ended in violence, though it highlighted the growing fury of Western landowners over the federal government’s bullying practices. The Trump Interior and Agriculture Departments are attempting to rein in these abuses, reminding federal employees that private landowners are crucial for conservation and economic stability across rural America. The change in policy is overdue, as was justice for the Hammonds. Appeared in the July 11, 2018, print edition. It started over two long-ago backfires set to protect a local ranch, something that was standard practice back in the day. Details are murky. Even the “original fire” and the backfires set by a Hammond son needs reexamination. The Hammonds, all these years, thought they were setting backfires to stop fires that had been caused by lightning. This was common practice, and was even touted as “BLM best practice.” Also, now there is allegedly a witness who has signed an affidavit that they witnessed the Feds starting one of the original fires. This is brand new. Why are these ranchers in prison as terrorists? Why have citizens from all over the country been supporting them? This from a close friend of the Hammonds, Laura Jones. More detail can be found in her comment down under this post. Two dear friends of mine —salt of the earth ranchers, ages 74 and 47— were convicted under the Antiterrorism and Effective Death Penalty Act of 1996 (AEDPA) for “maliciously” setting fire to under 140 acres of Federally administrated range ground —ground which they owned the grazing rights to— carrying a mandatory minimum sentence of 5 years. One fire, a preemptive, defensive backfire burned around one acre, the other, a prescribed fire that trespassed on about 138 acres. Contrary to media coverage, and the claims of the prosecution, both fires were started on the Hammonds’ private ground to protect and enhance the vegetation, and both had verbal authorization from BLM personnel. Due to long standing animosity between the Hammonds and various federal employees —partially stemming from the Hammonds filing a claim on, and ultimately obtaining, a water right that the Federal government had once laid claim to but failed to prove beneficial use of— the Hammonds were targeted, and made an example of. One judge had deemed the mandatory minimum cruel and unusual, a sentence that would “shock the conscience,” sentencing them to 3 months plus probation for Dwight, the father; and 366 days plus probation for Steven, the son. The two acquiesced, and did the allotted amount of time —in SeaTac, an administrative security federal detention center with no yard and where the only windows were painted black, they didn’t see sunlight for three months. Read more about the Hammonds. This is where it started. Those who were arrested (or killed) in Oregon came from all over the country to peacefully protest and to support them. Here is a good article about the long accepted use of backfires to control wildfires. This was common practice for decades — but now the Obama Administration has chosen to prosecute ranchers as terrorists. Here is my interview with Michael Connelly, Executive Director of the United States Justice Foundation on 3/23/2016. It covers ALL my novels, which most now term “political Thrillers.” The last portion focuses on the January 2016 so-called “occupation” in Burns, Oregon where rancher LaVoy Finicum was shot and killed by the Oregon State Police. From the start it was clear that the situation in Burns was being managed by people at high levels. Weeks before the LaVoy shooting, the FBI was caught in a “False Flag” operation. It was sending in Agents posing as protestors to harass locals. This so outraged the well-respected local Fire Chief that he resigned. Link. Other than one speech after LaVoy was killed, Congressman Greg Walden (representing Burns) has kept his distance. Here is the speech where he addressed the U.S. House about the situation in Harney County, OR. He criticized BLM policy, but did not demand a full disclosure of the facts surrounding the LaVoy shooting. Nor did he choose to question the Federal Invasion and taking of citizens who had never fired a shot or harmed anyone as Political Prisoners. I mentioned the “backfire incident” as the Burns incident was still unfolding to friends (Democrats, FWIW) in the Oregon legislature. They told me that the Federal Government had indeed been setting such fires back in the day. 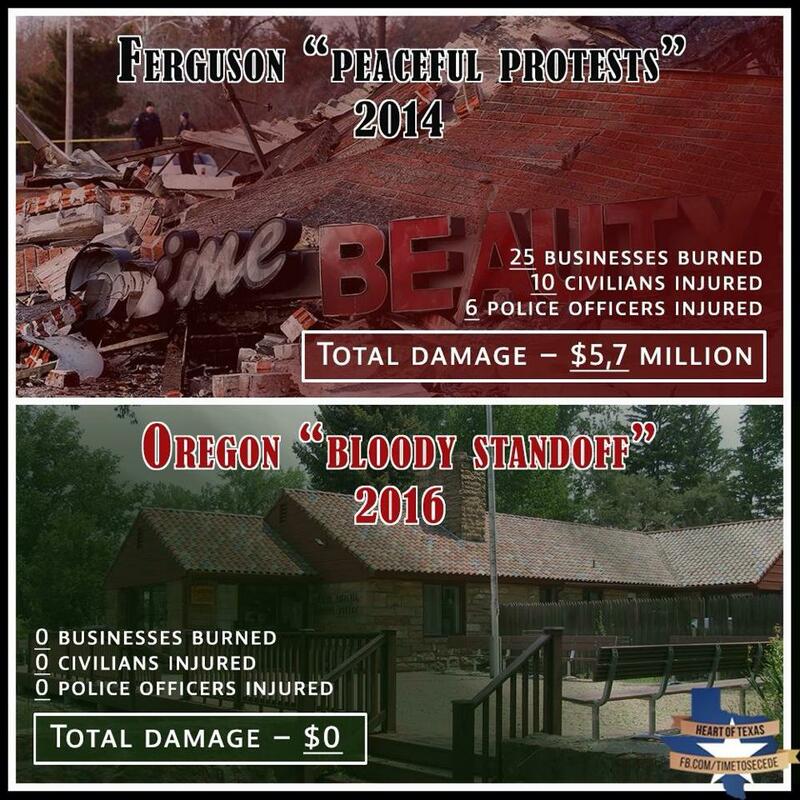 This is well documented, because some of those fires had gotten out of control and damaged private property. Which resulted in lawsuits and that practice being discontinued. Many years later, the Hammonds were convicted — under TERRORISM LAWS — of setting a backfires that damaged Federal land. [They had long ago admitted to the backfires. They were set to protect their own property, and got out of control.] They took a plea bargain, served their time, were released, but then the Obama Federal Government came back, argued the Federal Judge had made an error, and re-sentenced them to long prison terms. Which resulted in the peaceful — but armed — protests. All of this comes under the category of “most unusual.” A case of Federal overreach and taking of private lands, which has been all-too-common in the West. The Federal Government may not even own the land upon which the ranchers were camping. Hence, protests. Still, discussions were peaceful. Folks were working things out. Then comes Oregon’s un-elected, radical left, self-proclaimed bisexual governor, who gives an intense “Who will rid me of that troublesome rancher?” press conference, and concurrently orders the State Police (OSP) to take exceptional action to end this. So the troublesome rancher leading the protest is lured into a kill zone. 43 miles of highway are blocked off, and he is ambushed and shot to death. Who to bless and who to blame? There is a lot of blame to go around. Surprisingly — and most have this wrong — this killing was NOT done by the Federal Government. The FBI was there, but only as observers. The FBI did not shoot LaVoy, so far as we know. This is not a Waco, it is a homegrown Oregon disaster, but one that advances the Obama national political agenda. Local law enforcement was not there. The local sheriff (critical of the protesters, but not inclined to use force) did not participate. In fact, it was well known that the victims (aka criminals) were on their way to attend a large (for the area) peaceful meeting in John Day, where they hoped to meet Sheriff Palmer (supportive of the protesters) to discuss issues. They did not make it. They were ambushed. As Michele Fiore from the Nevada legislature, who visited the refuge and got the last four people out alive points out — it stretches and twists the meaning for words to say that these cowboys “occupied” the (unlocked, open) wildlife refuge, that was privately owned until it was taken over by the Federal Government. It is more accurate to say the ranchers camped there, just as approximately 2,000 “homeless people” had been camping in tent cities in Portland, Oregon for years — dealing drugs, creating problems, and committing violent crimes without any objections whatsoever from unelected Governor Kate. Link. Please note that the LaVoy truck was taking gunfire before it approached the roadblock. before it stopped moving, and long before he exited the truck. Also note that the issue of an illegal “Dead man’s” roadblock (around a blind curve with inadequate distance to safely stop) was not discussed. Nor was the issue of a pre-planned kill zone (snipers in trees, branches having been removed by chain saws, etc.) discussed, or the issue that shots were being fired at the truck before LaVoy exited and after he was down. See link. Here is a video where Sheriff Ward of Burns ADMITS that he set up the premeditated murder of LaVoy Finicum, making sure the kill zone was set up in a dead area for cell phones. Check this about 12:40 in. Since when does a team of elite FBI agents participate in a routine “traffic stop”? Who sent them, and what were their orders? Link. Also, Obama’s Minister of Justice, Ms. Lynch, visited Portland the day before this finding of a justified shooting was released. Lynch gave an interesting policy announcement: Team Obama — which ignores Islamic jihad — is aggressively prosecuting ranchers as terrorists. Here is an excellent Presidential candidate’s comment about Obama’s BLM tyranny, this one from Trump, but I expect Cruz would say much the same. Link. Oregon Republican League — The Obama DOJ is ARRESTING PEOPLE FOR THOUGHT CRIMES? OMG. Congress, where are you? Tyranny is afoot. This is right out of Soviet Russia, Nazi Germany, and SF movies like Minority Report. Arrests are taking place of women armed with cameras who visited the Bundy Ranch. As I recall there were thousands who visited the Bundy Ranch. One of the issues raised by the FBI as reported by those questioned was of “intent“. Trey Gowdy, past prosecutor and now Congressman from North Carolina notes, intent cannot almost ever be determined directly but rather by circumstantial evidence of intent. Here is Trey Gowdy questioning Loretta Lynch and the fuzzy thinking applied by the Federal Government and how it can be used either to indict or dismiss charges. So what about the shooting itself? Was it murder, or a righteous shoot as is now officially declared? Good question. I have friends on both sides of that one. The “occupiers” were not blameless, they had violated laws, though at the time of the LaVoy shooting none of them were charged with any crimes. Neither had any arrest warrants been issued. Was LaVoy reaching for a weapon? The official ruling, at this writing, is that he was, and that, hence, shooting him was justified. This finding is based on an FBI video. My own sources — including many in law enforcement — are divided. I have watched the (very poor quality) FBI video several times, including even a stabilized, enhanced version on a large screen monitor. I can’t tell if LaVoy was reaching for a weapon or reacting to being shot. Can you? Where are the OSP videos? Here is what I do know. This was NOT a shootout. The only shots fired were by law enforcement. The shots fired were by OSP [plus now at least 2 more that the FBI finally admitted to, one of which reportedly hit the truck], and they fired off a LOT of rounds. OSP’s own procedures require that all such incidents have to be videoed, achieved, and recorded. In this case, the ambush was pre-planned. 43 miles of road were blocked off, and a kill zone in an area with no cell phone coverage was set up. Released after the acquittal of the Burns Defendants in Portland. Dual-screen replay of the ambush of Lavoy Finicum’s truck. Cellphone video in the truck synched with FBI helicopter overhead. Couldn’t have put it better myself. As of January 2017 we are still awaiting the prompt release of all OSP records of this incident as is required by law. Of the survivors from the LaVoy truck, only two are free and one of these is facing charges. Both are female. Both testify that the truck was taking fire. One, Ms. Sharp, is in hiding. The other, Ms. Cox, was publicly speaking out but and was placed under a gag order. She lost her son-in-law in a “mysterious fire” shortly after she was ordered to remove her guns from where she was staying. She complied and moved them to her daughter’s house. The shop then burned down, killing her son-in-law. Here is Shawna Cox’s last interview before she was gag ordered. Link. The death of Shawna’s son-in-law makes the body count from Burns now equal to two. On top of this, the ranchers, citizens, and reporters who protested in Burns are now in prison facing serious Federal charges. Most are being held incommunicado and being denied bail. HERE IS WHERE I AM: I think ALL the OSP evidence, including videos from body and vehicle cameras, needs to be made public. 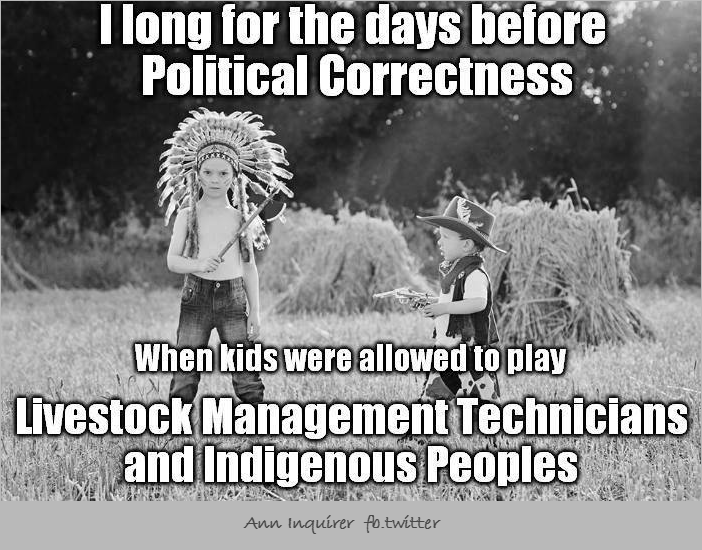 These days, everything is political, and this debacle reaches the highest levels. Think of it as Oregon’s Benghazi. When the Oregon legislature was in session, some worked hard to pass legislation to delay the release of this evidence. Link. They failed. The legislature will not reconvene until 2017, so the law says this evidence must be produced. I see no hope of this being sorted out without full disclosure and court involvement. As for my opinion, and however the technical details of the shoot sort out, my personal view is that this tragedy can be laid at the feet of Governor Kate. It did NOT need to happen. How did I (not a rancher, an Indy novelist who writes political thrillers) get into this? Well, I live in Oregon, happened to be here when it happened, and I track such things. Within hours of the shooting, a source sent me the interview of the first witness, an innocent young woman who was in the target truck when OSP (and the FBI, as it turned out!) started shooting at it. A singer of patriotic songs who visited the refuge to perform, she wanted to attend the meeting in John Day and had missed a ride with her family. She is fearful and now in hiding, I know not where. And I do not want to know. Link. I hope for the sake of all parties that all the OSP records are made public soon. 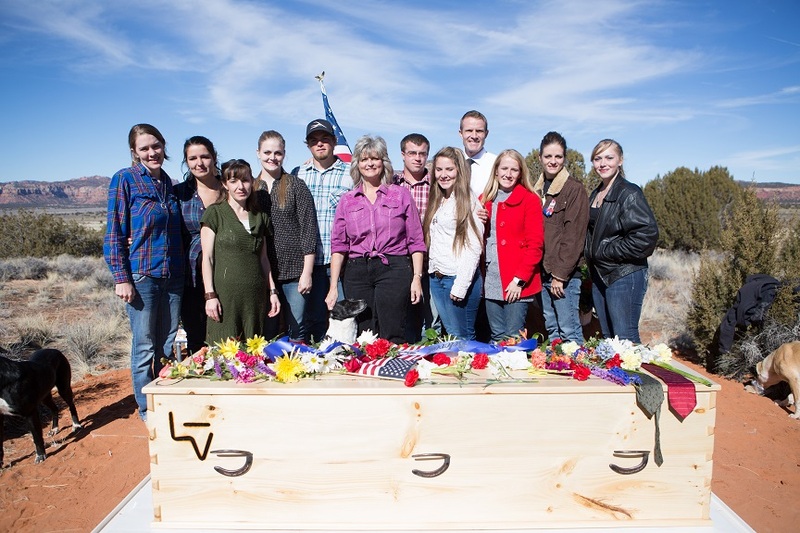 Link to video of the dedication of the LaVoy memorial. Link. OMG. This will go down as the Oregon equivalent of “What difference does it make? Whatever results as this plays out, it is clear that the issue is MUCH larger than the tiny, isolated town of Burns, Oregon. The core issues are FREEDOM, ACCOUNTABILITY, AND THE CONSTITUTION. These issues may extend to TYRANNY if corruption and misconduct can be proven. [Which, BTW, we are still trying to do for Oregon’s last governor and his girlfriend. Several investigations are active, and they show no signs of being resolved before the next election.] Despite what the Portland and National media reported, locals mostly supported the protestors. Link. Focus in the media has been about the Lavoy Finicum killing and to generally portray ranchers (who never harmed anyone!) as terrorists. This disaster, like Benghazi, would seem to justify a select committee and an independent investigator. The Obama DOJ cannot be trusted. Here are some comments from a Constitutional Attorney. She argues that this is not about ranchers, it is about Federal Violations of the Constitution. Link. Having the FBI involved in a criminal cover-up about the LaVoy ambush and shooting. Burns suffered an occupation by thuggish, unidentified mercenaries who manned road blocks, pointed guns at innocent civilians, and terrorized locals going about their normal lives and business. Who were the “Shooters”? The occupation of Burns was by these mercenaries and the FBI, not by a few ranchers camping at the wildlife refuge. Who employed them? 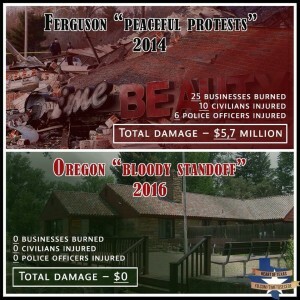 Was it BLM or one of the other Federal bureaucracies? Was it the UN? If the Oregon Governor had wanted to impose Martial Law on Burns, why didn’t she use the National Guard? There has been a selective enforcement of law that smacks of the old USSR. Ranchers and reporters are being prosecuted as terrorists and held without bail. Obama has suspended habeas corpus for the first time since the Civil War. There is a systematic pattern of the Federal Government using dubious procedures to take over private lands. It goes beyond the Bundy and the Hammond ranches. Here is a story that predates the incident at the Bundy ranch, told by another rancher who was forced out. Link. Testimony that there was no damage to the refuge until AFTER the ranchers were gone. Millions of dollars in damages are now alleged. Some of the charges leveled at the whistle blowers (ranchers) include damage done at the Refuge. We know that the damage was not done by Ammon or his team. The damage was done following the assassination of Lavoy Finicum. We have been given first hand testimony and pictures about the day before the assassination and the condition of the refuge that day. David Cain and Cathy Giebel we appreciate your words and the pictures provided. Link. David Cain: Our Trip to burns OR and out to the refuge, was short, delayed by bad weather and a long drive we arrived on the 24 of January checked into a motel, (the only one with vacancies) and proceeded to look around the town, and then dinner with a local friend. We encountered large numbers of “Law enforcement” heavily armed and unwilling to clarify what agency they worked for which is bothersome on many counts. The next day traveling out to the refuge was uneventful, no road blocks or evidence of a standoff of any kind, on arriving we parked by the gate at the road and talked with the young men “Standing” watch and then were offered a complete tour of the BLM facility, this included most every building and the stories of the cleanup that the protesters had done upon arrival, this was evidenced by the large pile of trash bags and the very clean and tidy appearance of the entire grounds and buildings, we saw no evidence of vandalism or unsanitary conditions, and sensed the occupiers felt pride in their work to clean up and repair and maintain the facility better than when they found it. Cathy Geibel: I was drawn to the Malheur Wildlife Refuge, not only from curiosity, but by forces I believe to be of God, to witness an event unfolding that would be pivotal to our country and We The People. What I found when I got there was a peaceful occupation by people who truly believed in the Constitution and Freedom. People willing to make a stand and call out the Federal Government for it’s corruption and overreaching policies. Never once did I feel afraid while visiting the refuge, never once was a gun drawn nor was I challenged as I walked alone around the “public property” which was extremely clean, respected and from what we were shown, cleaner than when they first set foot there. Any reports to the contrary are bald faced lies The occupation by the Feds of Burns though, well, let it suffice to say there were guns drawn and I WAS afraid. Kate Brown allows thousands of Wall Street occupier drug addicts and homeless people to camp out all over the streets of Portland and other major Oregon cities. Despite violence, drug dealing, crime, and damage to businesses, Governor Kate has raised no objections. In fact, she wants to give them houses. Conversely, because a group of about 20 men occupied the Malheur bird refuge and her liberal self-image couldn’t handle a few conservative protesters exercising their Constitutional right and civic responsibility to oppose the illegal and unlawful actions of our Federal government’s overreaching actions against ranchers in Oregon by stealing their land and throwing them in prison, she told law enforcement to end the occupation, which caused the OSP to ambush and murder an American hero LaVoy Finicum in cold blood while the FBI sat idly by and not only let it happen, but are trying to cover up that it was cold blooded murder and want to make it appear that it was in self defense, falsely claiming that he and others were armed when they had already posted on social media that they were heading to a meeting with Grant County sheriff and ranchers there to train them on their Constitutional rights and duties. More information about the Federal and State Assault on Burns, Oregon. The protesters are gone, but the town remains on lock down. The area is, for all practical purposes, under Martial Law. The LaVoy shooting was done by the Oregon State Police, but it remains unclear who the heavily-armed Paramilitary forces that have been locking down Burns represent. They are NOT National Guard, NOT FBI, NOT State Police, and NOT local law enforcement from police or the Sheriff’s Office. No identification is on their vehicles or uniforms. They claim to be police but will not produce Creds (show ID) to prove it and reveal their names. Who are these people? What authority do they assert? Who do they work for? I do not know. See below for what locals are saying. “(INTELLIHUB) — With the occupation of the Malheur National Wildlife Refuge finally over after the four remaining occupants surrendered to the FBI without bloodshed, the mainstream media has largely turned their focus away from Harney County and the small Oregon town that became the epicenter of revolt against gross federal government overreach. Despite this, there remains an extremely important story to tell, one that includes all the hallmarks of a literal police state including road blocks, road closures, check points, private mercenaries, papers please demands, and even guns pointed directly at the heads of law-abiding American citizens. Who had the town locked down? Who was terrorizing the locals? Not the “protestors” and not the local Sheriff. Not even the FBI, though the massive Federal presence was intimidating and uncomfortable. Not, thank God, the UN, though Obama has recently announced a program to invite UN “peacekeeping forces” to America. Link. But it WAS NOT the FBI at the airport. My guess is that these heavily-armed private contractors were working for some Non-Military, Non-Law Enforcement bureaucracy in the Federal Government, most likely, as in Nevada during the 2014 Bundy incident, the BLM. 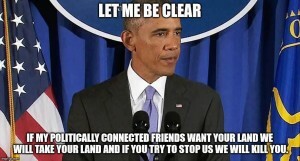 “I am about to walk you through carefully, step by step (fact by fact), and prove the federal government conspired with its “partners” to murder LaVoy Finicum, and with the additional threat of lethal force arrested other patriot protesters in an attempt to cover up the federal government’s war on the United States, i.e., to cover up the feds’ acts of treason against the United States. About two years the Nation watched as Cliven Bundy stood in opposition against an unjust seizure of his ranch and grazing rights by the BLM. The event grew as patriotic Americans responded to his aid. The growing protest was ultimately successful in forcing the BLM to turn tail and retreat in face of the growing support that they could no longer control. Fast forward now to January 2, 2016 and we have a similar situation with the BLM is small town out west called Burns, Oregon. Since the start of this protest, the Main Stream Media (MSM) has been putting forth articles and news reports using such adjectives as “armed militants”, “right wing racists”, “terrorists” or “armed thugs.” Every story I read or listened to was basically the same, always one sided. I follow the belief that there are 3 sides to every story; you could call it her side, his side and the Truth. So when only one side is ever told, it is safe to assume that there is an agenda afoot. An agenda the MSM never speaks about. There’s Something Strange Happening Here: VERY EYE OPENING ARTICLE ON BURNS OREGON-TALK ABOUY OVERKILL-TAKE A LOOK AT THE PHOTOS! In September 2011, a representative from Oregon Energy, L.L.C. (formerly Uranium One), met with local citizens, and county and state officials, to discuss the possibility of opening a uranium oxide (“yellowcake”) mine in southern Malheur County in southeastern Oregon. Oregon Energy is interested in developing a 17-Claim parcel of land known as the Aurora Project through an open pit mining method. Besides the mine, there would be a mill for processing. The claim area occupies about 450 acres and is also referred to as the “New U” uranium claims. For more, see this link. And this link. The New York Times published an article about the Clinton Foundation, its receipt of millions of dollars from foreign governments and other interests, and the U.S. government’s involvement in Russia’s stated goal to expand its control of the world’s uranium market.All while Hillary Clinton was Secretary of State.The NY Times didn’t reach a conclusion, but one question looms very large: As Secretary of State, did Hillary influence an international deal giving a Russian company 20% ownership of America’s uranium production, in return for millions of dollars of cash donations to the Clinton Foundation?Here is a list of 11 questionable items forming a chain of events:September of 2005: Canadian Frank Giustra visits Kazakhstan with Bill Clinton. 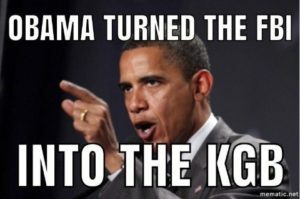 Days later, his company UrAsia wins a major uranium deal with the country.2006: Giustra donates $31 million to the Clinton Foundation.February 2007: UrAsia merges with Uranium One and expands into the U.S..June 2008: Russian atomic agency Rosatom begins talks to acquire Uranium One. 2008 to 2010: Uranium One and UrAsia investors donate $8.65 million to Clinton Foundation. June 2009: Rosatom acquires 17% of Uranium One. 2010 to 2011: Millions more donated by Uranium One investors to Clinton Foundation. June 2010: Rosatom requests Committee on Foreign Investment (of which the State Department is a member and its approval is needed) to approve a majority ownership in Uranium One, promising not to purchase 100% of it nor take it private. June 2010: Bill Clinton receives $500,000 to speak at a conference held by the Russian investment bank involved in the Rosatom transactions. October 2010: Committee approves Rosatom’s request to acquire a majority share in Uranium One. January 2013: Rosatom purchases remainder of Uranium One and takes it private. Unlike more established competitors, Mr. Giustra was a newcomer to uranium mining in Kazakhstan, a former Soviet republic. But what his fledgling company lacked in experience, it made up for in connections. Accompanying Mr. Giustra on his luxuriously appointed MD-87 jet that day was a former president of the United States, Bill Clinton…. Just months after the Kazakh pact was finalized, Mr. Clinton’s charitable foundation received its own windfall: a $31.3 million donation from Mr. Giustra that had remained a secret until he acknowledged it last month. There are intricacies and subtleties to this story that aren’t evident in the timeline. For example, when Hillary assumed the job as Secretary of State, she assented to a limitation of the foundation’s international activities and agreed to disclose contributors. It appears, at a minimum, there was incomplete follow-through upon these assurances. Here I thought I would NEVER quote the NY Times, but one of their early articles about Clinton corruption and plundering of America’s uranium is useful. Link. More. Here is what Fox News (Hannity) said about this Clinton deal in 2017: Link. President Obama has signed executive orders allowing the Department of the Interior to grab publicly owned lands. This is nationwide, not just in Oregon or Nevada. June 2016. There is more outrageous news coming in from Burns. Private Memorials on the roadside at the spots where people have died are common in Oregon. Many have been there for years, some for decades. It is a crime to deface or destroy them, except for this one. The memorial that private citizens constructed at the site where LaVoy Finicum was shot has now been destroyed at least five times, at least two of them by a local Deputy Sheriff whose wife works for the BLM. He has boasted about destroying this memorial on his Facebook page. The feeling began to build on Friday. It was …curbed by a few cold ones, a great game of Cards Against Humanity, and a little Rock Band! (thanks Graham’s) Upon waking on Saturday the feeling was there again. At first, I thought hangover?? Nope, no headache, no nausea, felt right as rain. But, it continued to build. What was it? As I began my shift I received several text in regards to the days event. I cruised town to see several of those tell tell signs, stickers and writings in vehicles proclaiming their patriotism and sadness for the loss of a man that should have been home with his family. And there it was, the feelings I had felt for months this winter, all back in full force within days. In the beginning, this would be November; we took a hand off approach. Hoping those that were here would eventually just go away. Not today, today I would stop the ones I found and advise them that the items they were placing on the road way was littering. They of course played the “I didn’t know that” card. There were many out along on the highway Saturday. Some were littering, some were cleaning up. I spoke to many of them. I was told by several people Saturday that we needed to be mindful of the feelings of those placing the crosses along the highway. That if we just let them do it, they will go away and maybe more will not come to our community. I was given the same advice in November and we all know how that went. I began to think, what about the feelings of the other side. What those federal employees that could not go to work for 40+ days? What about the feelings of the other side of this movement? Do their feelings not count? Let’s get to it, what about my feelings? Yeah, I can have those. I spoke to a couple at the site. They were upset that someone would desecrate the site. They tried to tug on my heart strings and tell me the man was a father and a husband. They wanted to know what I was going to do about the person tearing the site down. I informed them that nothing was going to be done as no crime had been committed. They were astonished. They became upset when I explained that posting crosses along the highway was littering and the individual was cleaning up. They became very upset and said that was disrespectful. Each time the memorial was destroyed, private citizens rebuilt it, putting up a cross and and American flags. Some in power are trying to prevent this, to erase the history of the LaVoy shooting. Now they have made the memorial itself a CRIME! 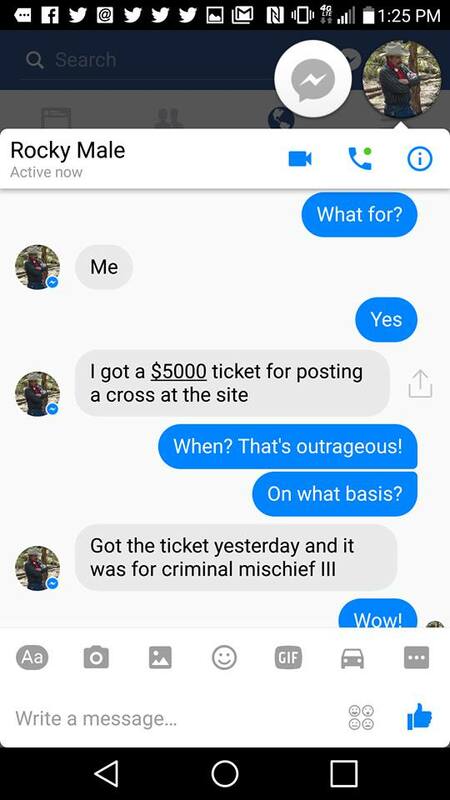 A $5000 fine for putting a cross up at a memorial? The Harney County Deputy sheriff (Lucas McClain) who has been destroying the LaVoy Finicum memorial (with others aiding and abetting him?) 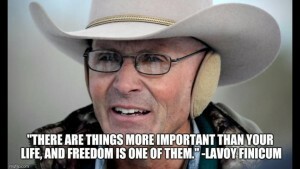 has doubled down on his efforts to erase memories of LaVoy. The spot where LaVoy was killed in now off limits to citizens. This Deputy is issuing “tickets” to any who “trespass” or try rebuild the Memorial, imposing Draconian $5,000 fines for “criminal mischief.” A secret law may (or may not) have been passed to make this legal. Or he may be doing this on his own, with local officials turning a blind eye to these actions by a Deputy Sheriff in uniform and driving a Sheriff’s car. This entry was posted in Actionable, Constitution & Gov, Enterprise, Military, Non-Fiction, Self-Defense - Guns and tagged Dark Side, Educational, Ethics, Guest Author, Heroes, Tyranny. Bookmark the permalink. 56 Responses to Bloodshed in Burns, Oregon. Who to Bless? Who to Blame? 1. The autopsy report that clearly shows how many times and where Mr. Finicum was struck by bullets. 2. A complete description of all bullet strikes on both vehicles and a report on who fired the shots and the authorization for firing each shot. 3. A release of all videos of the incident taken from any perspective including dash cams, body cams or hand held cameras. 4. A shots fired report by every law enforcement that fired their weapon and the specific justification for doing so in each instance. If the above are not voluntarily released by the law enforcement agencies involved; a law suit or freedom of information act demand should be filed as soon as possible. To this I would add one point. In this case, it seems obvious that the shooting of Mr. Finicum was pre-planned: A road was blocked off, an ambush was set up, and a kill zone was established. 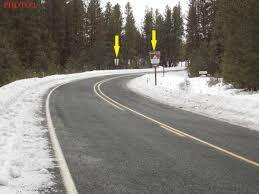 There were rules such as who was to observe (FBI) and who was to act (OSP – Oregon State Police). Assets were pre-positioned. I think it would be appropriate that all briefing presentations, meeting notes, and communications [tapes and logs] also be put into the public record as part of this investigation. The makings of the next Civil War. How many American law-enforcement officers will be willing to employ lethal force and fire upon family, friends, and neighbors? If my readers have seen the film of his demise, you have watched the Ultimate Result of a person with no plan. BTW, in his intentional effort to drive around the roadblock, he hit (or missed by inches) a cop at the roadblock. NO Grand Jury would refuse to find that act to be anything but attempted murder. Sorry, Patriots, this man did NOT die well for his cause. Do NOT place him on any martyr’s pedestal. BTW, Oregon State Police, one of YOUR troopers, the one who shot Finicum with a long rifle at close range, disobeyed the First Rule of Deadly Force use: the trooper fired on Finicum with a rifle which, even if it hit him squarely, MUST be expected to over-penetrate. Did you see what was DIRECTLY in the trooper’s line of fire? Finicum’s vehicle with multiple people inside, none of whom, to my knowledge, had a proper Execution Order outstanding on them. The Trooper, the Trooper’s Supervisor, the On-Scene Commander, and ultimately governor Brown, who ordered the OSP to take enforcement action, are ALL guilty of impropriety here. At the LEAST, the Trooper should be indicted and charged with Official Misconduct AND Recklessly Endangering the life of Another (as many counts as there were persons in Finicum’s truck). That same Grand Jury, which, by law, must be empaneled in Harney County (think about THAT for a moment), ought to consider how much blame to assign those up the chain from the Trooper who violated Oregon Law. The Foreman of the Grand Jury, at his/her discretion, may issue a public report on their findings, apart from the actual indictments, which must remained sealed until the warrants resulting from them are served (arrests made). The video doesn’t show the aftermath: The OSP “stormed” the vehicle, using projectile-driven chemicals (probably “ferret rounds”) and concussion grenades, (called “flash-bangs” by the police to soften the concept of civilian use of grenades, which is horrible). The lethal circumstances of resistance to cause this over-weening display of combat force? Ummmm….probably none. The people in the truck were physically stressed by having just undergone a vehicular crash (FBI’s description, not mine), they were stressed by seeing their friend gunned down by a rifleman whose barrel was pointed at THEM as he fired, and they were further mentally stressed because they had all tried to get Finicum to stay in the vehicle and surrender, and they had failed in that attempt, and likely felt responsible for his death. Bottom line here? The OSP use of force against the remaining people in the vehicle was DEFINITELY EXCESSIVE, likely CRIMINALLY EXCESSIVE. A Harney County Grand Jury needs to consider THAT issue as well. It is my CONSIDERED personal opinion, and I publicly state my willingness to travel to express this opinion before a Grand Jury as Expert Testimony, that this entire sorry display was DIRECTLY caused by Governor Brown’s personal pique that the FBI, which handled the situation with excellent professionalism, did not act fast enough to erase this conservative “blot” on “her” Liberal Oregon, and so directed the Oregon State Police to act with extreme prejudice against the Bundy Militia. There is more dirt on the 2 judges and the FBI guy in charge that there is on the Bundy’s and all the “not-really-a-Wildlife Refuge” occupiers, combined. All of whom are being held without bail, and in solitary confinement. * Judge that re-sentenced the Hammonds under double jeopardy resigns under investigation. * Judge that denies bail and puts Bundy’s and occupiers in solitary confinement was fired by President Bush for unconstitutional conduct. But don’t worry, if you’re arrested for demanding your Rights and the Rule of Law be upheld, you’ll get a fair trial, huh? Sniff, sniff – Is that kangaroo poop stench blowing in from Portland and Salem? — Maj. Gen. Paul E. Vallely (Ret.) and Stand Up America. The saga of a Federal Invasion of Burns continues. Team Obama and Oregon’s leftist media is now attacking the local Oregon Sheriff who supported the Protesters. 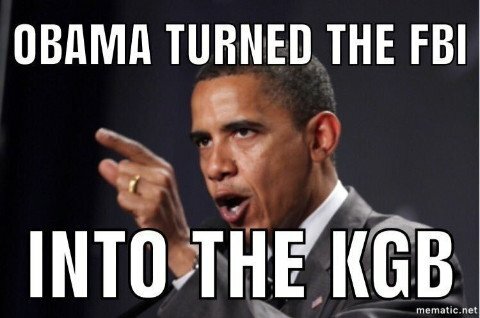 Everything under Obama is political. Alinsky tactics of intimidation and personal attacks are all too common. “I have a great public safety concern when the Grant County sheriff is allowed to openly meet with and be part of this group of lawbreakers,” said John Day Police Chief Richard Gray in his complaint. Another glaring hypocrisy shows up in the discrepancy in the way in which Oregon Live treats Grant County Sheriff Palmer versus BLM-Fed man, Harney County Sheriff Dave Ward, who met with the Malheur protesters, including the Bundy’s, on several occasions…. Great interview with Jeanette Finicum! She reveals that the Finicum’s lawyer was prohibited by the FBI from seeing LaVoy’s truck. Now why wouldn’t the FBI let the lawyer of the man they killed see his truck? Could it be that the number of bullet holes in the truck would confirm the stories of the passengers inside the truck who say that the feds were trying to kill them all? That is, until people showed up with cameras and started recording the event – bringing the attack to an end. Remember, Ryan Bundy took a bullet during this barrage. 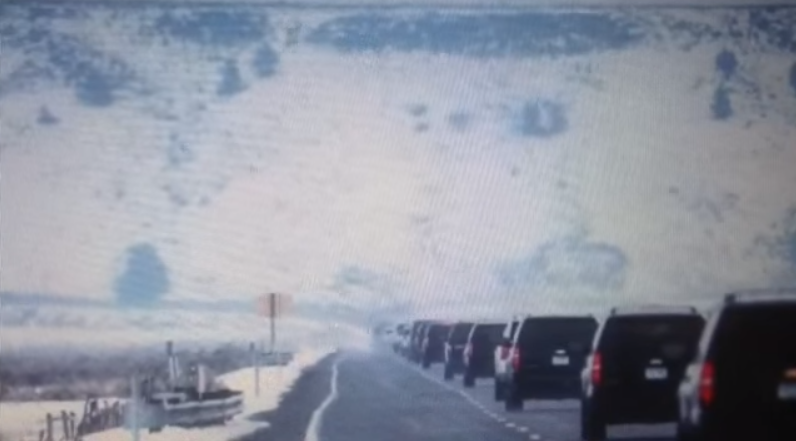 The feds had just gunned down LaVoy in the snow and the passengers in the truck hadn’t made any aggressive moves. Since when are the authorities justified in opening fire on citizens in vehicles who haven’t done anything wrong? If what Victoria and Shawna have said is true, they are very lucky to be alive. I believe that LaVoy’s actions and the arrival of spectators saved the lives of those three passengers. We attended the Harney County Chamber Awards Banquet last night. Past award recipients: Woman of the year 1991-SUSIE HAMMOND; Young Farmer/Rancher of the year 1999-STEVEN HAMMOND; Grassman of the year 1991-DWIGHT HAMMOND. I don’t believe that there has ever been that many members of one immediate family to be awarded distinguished honors from the Harney County Chamber of Commerce. As we sat at the banquet last night honoring PAST and present award recipients, two of these honorees were spending the evening in Terminal Island Federal Prison labeled as terrorists. As long as we keep them upfront, until they are set free. Thank you members of Harney County, who honored the Hammonds’. I wonder if Judge Grasty was there??? Several have commented that this “roadblock” was illegal, as it was hidden behind a curve and NOT visible until too late. See the pix on my blog post, “Dead man’s roadblock.” Governor Kate forced a no-win situation. Congratulations Governor Kate Brown, you’re famous! People from all over America are speaking of you. I’m sure you’re not bothered in the least by this Southern sentiment because they’re beneath you but if you weren’t so beyond the average American you might hear some wisdom in his scathing review of your ridiculous strategies. It’s prophetic how someone 3,000 miles away called you out on your decision well before the eventual outcome but yet so many right here cheered you for your haste and intolerance. Now as you begin to realize your error in judgment and wonder how to undo what you have done you begin to recognize you may have imposed a life sentence upon yourself. A life of guilt and regret. By now you have learned of the man you killed. You didn’t bother to look into who he was before you killed him. He was simply a target. Someone you were told was a threat. A hostile Militant causing fear in Burns. You were played like a fiddle and now it’s becoming real to you. You’ve seen his Children mourning, you’ve learned what an amazing, kind, peaceful and gracious Man he was. Alone at night, it’s starting to haunt you. You’re trying to justify it and align your excuses but you’re beginning to realize you can’t convince even yourself. You’ve recently started wondering, what if? What if you had allowed it to end peacefully? What if you actually made an effort to talk with them and understand or even sent someone to learn what reality was? What if you trusted your own police agency to deal with it and to address the issues that were causing the problem? What if the Redress of Grievance was considered and it was found that there indeed WAS a miscarriage of justice. You probably haven’t even looked at it. That these peaceful Men and Women were simply crying out for those who were YOUR Citizens and who were under attack by a ruthless monster. You allowed your own good people to be abused, tormented, and victimized. Then you called upon the same thugs that so brutally attacked your Citizens to kill those who came from afar to render aid. You put your own law enforcement officials at risk. First with a hidden roadblock. They were all huddled behind the trucks blocking the path of a Man desperately trying to find safe harbor in John Day. Your boys had already fired upon him and the 18 year old young lady in his truck. You saw to it that he ran for his life and into the awaiting funnel of death and destruction. You saw to it that he had no options of peaceful resolve. You left him only one option, carnage. Were it not for his integrity and quick thinking, you would have several of your own to add to those who perished, as he could not stop. Had he not swerved to avoid the collision you assured would occur all who were behind those trucks would have perished. Whoever orchestrated this roadblock did so with mass casualties in mind. They were willing to sacrifice their own officers to get the end result they wanted and needed. They wanted LaVoy Finicum to be a villain and to finish the narrative that he was a risk and a danger to society. The men who were ordered to stand their ground behind those trucks should be calling for your resignation. They were victims of your scheme as well. What do you expect them to do when a speeding truck rounds the turn headed right for them and with no ability to stop. Maybe they were eager to kill or maybe they were just taking orders and put in harm’s way. Maybe they were victimized as well and used as pawns to carry out your orders. Maybe they’re starting to realize what you’ve done to THEM as they now have to face scrutiny and reconcile their actions. I don’t believe that they wake up in the morning with the intent and desire to kill a saintly man, a young girl, a cowboy and a Mother. But yet you placed them in an impossible situation. You sacrificed them and you killed Mr. Finicum with intent. There is no plausible deniability. You made your intent clear with the letters you sent to the white house. Why were you in such a hurry? Why were you so intolerant of peace? Why couldn’t they spread their message of freedom? What is the harm in spreading a message of peace and freedom Ms. Brown? If that is so offensive to you as to take a life to stop it, what is your scheme? Where there is concealment and intolerance, there is evil, just like where there is smoke there is fire. Those who were killed and incarcerated were transparent, sharing and peaceful. You and your crew were and are hostile, covert, and refuse to give us access to the evidence. You won’t give us audio of the scene, video from the numerous helmet cams, access to the truck or photos of its riddled shell. You pretend to give us an “unedited” video but even that is a lie and has been badly dubbed. You even try to pass a bill concealing the names of those who killed! You have only one option and that is to own your mistake, or your vindictive intent. Accept that you erred and ask forgiveness. Undoubtedly, you will not do so and try to stand on the crumbling ground of your lubricious and decaying foundation. As you filter all of this, you may find temporary solace in denial and your paid mistresses who assure you. But at the end of each day you no doubt wince when the reality of your condemnation sweeps over you, and you realize there is no escape. I wonder what it’s like to suffocate in your own fear as you realize you have the blood of a saint on your hands and you wonder, what is to happen to me now? The radical left makes great use of Saul Alinsky tactics. Truth is to be avoided. Hillary studied Alinsky, and Obama taught his methods to SEIU and ACORN thugs. Part of Alinsky tactics is to demonize your opponents (Ranchers = Terrorists), and part is “Alinsky lies” – statements that are 90% true, but totally misleading. In regard to the Harney County disaster here are two such statements what have appeared in the local press. In each case, if the full truth was told AS PER CAPITAL LETTERS, the message contained in the statement would shift 180 degrees. Most of the Media, be it TV, Print, or Radio can be very one sided depending on who you listen to or read. The local papers in Oregon are very Liberal…so you will never get the truth… Many of the Rural people and non-liberals know the truth and share it the best they can…usually social media… Like the National Primaries only half the truth is told..and when it is told… some do not listen because they are unaware of the truth and don’t really care…their lives go on…. and so they have too fallen into ignorance which empowers the evil. Informed persons can share and Pray that the govt. is held responsible…brought to justice just as you and I would be… but they have the power, the intellect, attornies paid by tax payer funds and judges from the local level to the State & Federal Appeals who are just as corrupt if not more so, than the common criminal on the street, doing drugs, robberies, and murder… Look at Hillary and multiple crimes….Obama the same….and many Congressional Old Rhino Republicans along with the Democrats who could care less as long as they in Congress can keep their seats and power. One old lady among all this seems pretty powerless, very heart broken, yet wanting to help save her Country for all the right reasons… not to have it and the Constitution ripped away from us… and all real patriots put into FEMA camps. God Bless ALL. 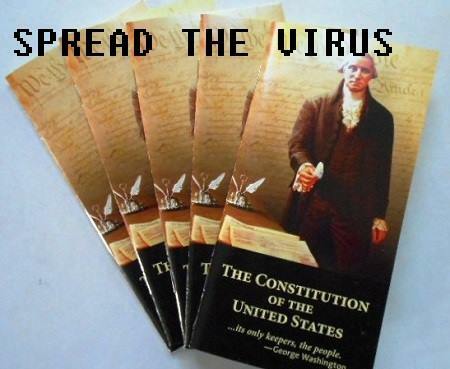 Stand for the Constitution and those that guard it… by all means…at all times…and our Bill of RIghts. 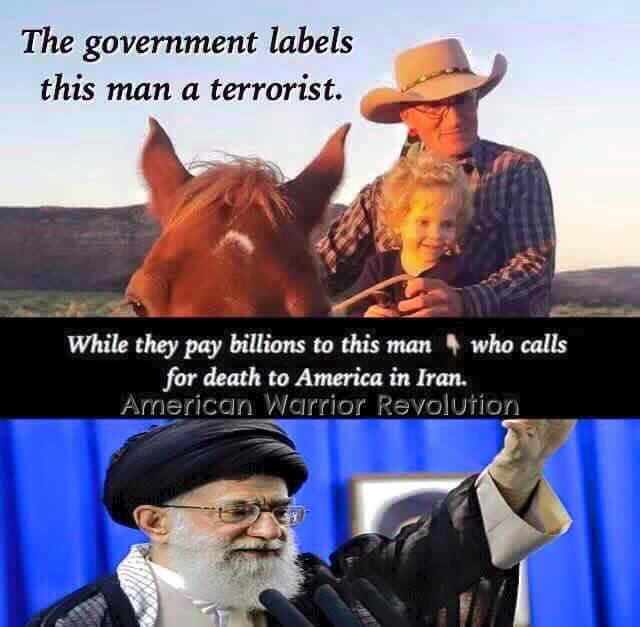 The right hand of Obama, the man who can’t say “jihad,” but attacks ranchers as terrorists. With one exception — Paiutes, with an Ex-Con tribal leader paid off by the FEDs with a casino — The tribes of Oregon seem to support the ranchers who took over the Refuge in Burns when it was left unlocked and open. “We know that the facts prove the Constitutional Posse did not do damage to the refuge or any artifacts, in fact they protected them and sent out multiple invitations for the Paiutes to come and check on them. The Posse put out multiple videos showing the horrific conditions the artifacts were found in and how rats, their feces and urine, had caused disgusting damage. The volunteers and BLM had not taken care of the artifacts stored, in fact, stored boxes were not only in ruin but were holding artifacts that were discarded decades earlier in the rooms. We know from first hand discussions with Harney County residents that the Paiutes had more concern over the 40 million dollars for their casino than any artifacts. Other tribal leaders through Oregon have denounced any respect for the Paiutes, not all are fit for print, but we can assure you there is no love lost between other tribes and the Paiutes. Did the Paiutes lack of respect for their heritage and the selling out for the casino funding give help in the assassination of Lavoy Finicum? One has to question why the offer to come and check on the artifacts was left unaccepted by the Paiutes, but an elder leader from the Siletz tribe did go, finding the artifacts safely stored and the storage area cleaned. 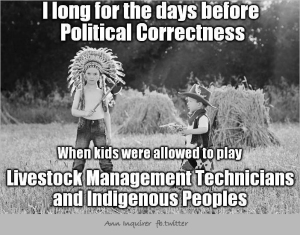 Where was that outrage when the BLM dug up land, brought in graders, dirt from other areas, built buildings over the artifacts and a septic system? Mrs. Finicum will take initial questions for the first time today from media in an 11:30 AM MST news conference at the Washington County Building 197 E. Tabernacle St. St. George, Utah related specifically to the civil and criminal lawsuits she and her legal team are pursuing. I know my husband, Robert LaVoy Finicum, and I knew him on the day he died. With his hands in the air, he was no danger to anyone, he intended no “imminent harm.” He was giving himself up in order to divert shooters from the others in the truck. Right down to the very last act of his life, he was giving for others. That was my husband. That was the man who the panel of investigators concluded was “responsible for” the situation in which he was killed in a well-planned ambush. My family and I reject the biased, whitewash findings and conclusion reported yesterday. My lawyers have assured me that the men who ambushed my husband, who set him up for death, who assassinated him, will face justice in a court before an unbiased jury that will be deciding whether my husband was killed by a wrongful action or omission on the part of the police. That action will be joined with an action based on violation of the due process clause of the United States Constitution, the very document for which my husband gave his life. That is a Civil Rights Act claim. Prior to yesterday the FBI held the position that my husband was shot during a “traffic stop.” That was such a stretch of the truth that even the tag-team news conference group could not repeat it. There was no “traffic stop.” This was an ambush by use of a “Deadman’s Blockade” designed to allow a “Kill Stop”—a roadblock on a blind curve on an almost abandoned road. I don’t think so. Not in America. I still believe we are governed by the same Constitution that our founders created and that we are a republic, one nation under God. Yesterday, as before, the officers set up a false scenario that my husband was reaching for a loaded gun as he was shot. Before yesterday’s selectively edited video showing, we saw the uncut version. In that uncut version, we see my husband with his hands up, walking away from the truck and not reaching for anything when a man to the right of the video obviously fired some projectile at him. Immediately he leaned over to his left hip area where it appeared some projectile hit him. At that one moment, shots were reigned down on him and he died there in the snow bank—where he lay for ten minutes without anyone checking to see whether he was alive. They let him lay there because they knew that the three shots into the back had killed him. My attorneys have already begun to assemble a trial team of investigators, paralegals, videographers and writers to make sure that the man who shot my husband in the back and all those who were accomplices will face justice. They will soon be filing the Oregon 30.275 notice that precedes a lawsuit for wrongful death and civil rights violations. At least twice yesterday the officials blamed my husband for being solely responsible for what happened at the site where he was ambushed. Again, my attorneys assure me that we can show differently, even with yesterday’s law enforcement whitewash. This tag-team said that the officers on the scene where the killing took place were there, putting themselves in harm’s way as part of an effort to “bring the situation at the refuge to an end peacefully.” This statement is consistent with the goal law enforcement announced from the beginning in this case: Let’s just get them out of the refuge building peacefully to the outside where we can talk. If they had been telling the truth, on January 26, they could easily have achieved their goal. They knew from an informant inside the refuge that all but four of the people inside the refuge would be leaving for several hours. That included the long trip to John Day, the meeting with Sheriff Glenn Palmer, and the ranchers’ workshop that evening on the original intent of the Constitution. So, I ask, why didn’t the officers pull the roadblock and let the group go out peacefully to John Day? Why didn’t they choose to arrest him while at the Sheriff’s office? If they had done that, this case would have been put in the books with the peaceful ending they now claim they wanted. In fact, the Harney County Sheriff had every opportunity during their stay at the Malheur Refuge to make a peaceful arrest during the numerous conversations they had with him in Burns. My lawyers believe we can show that was not their goal because there is no better evidence of their intent than their actions. So when the officials said yesterday that my husband was “solely responsible” for the situation and happening of his death, they were spreading their whitewash with a very broad brush. Yesterday one of the tag-team said that my husband chose to break the law, chose to put himself and other people in danger, and then chose to enter into a face-to-face confrontation with armed police officers. My lawyers have already discussed with me how the facts will show that the officers intended to shoot LaVoy, how an informant arranged for him to be in the lead truck, how the officers started shooting at the truck to force it to stop, and then finally how my husband gave himself up in order to draw attention away from the others in the truck. Contrary to what the panel of officials “found,” my husband was not responsible for the situation that ended with his death. He is not the one who blockaded the road with a “deadman’s blockade.” He is not the one responsible for officers armed with long guns firing from behind the trees. He is not the one who chose to block himself and his friends from leaving the refuge to go out to John Day. He is not the one who lined armed personnel all along the roadway from the refuge to the blockade. No, all those actions can be laid at the feet of the officials who spoke of their innocence yesterday. They will not have to explain their actions in a preliminary hearing or at trial, because their actions were glossed over—“law officers will take care of their own” I was told. But I still had faith in the system my husband fought to protect. I was wrong. We had no chance at justice in this investigation of law enforcement officers by other law enforcement officers, more like the fox guarding the hen house. But in a wrongful death action, coupled with a civil rights action, the shooters and their partners will make sure that the officers involved will face the same kind of music enjoyed yesterday at our expense. Yesterday the panel said that “the troopers knew that Mr. Finicum carried a weapon on his left side. Mr. Finicum was reaching for that loaded 9mm gun when the troopers lawfully used deadly force to protect themselves and others including the trooper armed with a taser.” You all have seen the full video where it shows the trooper with the gun or taser to the right of the screen as you look toward the screen. You see my husband lean over to his left hip area immediately where he grabs for the place he was hit. The gunman turns his back on my husband and runs. Isn’t it strange that a law officer turns his back on a person he believes to be heavily armed? Not so strange if he knows that his partner intends to shoot that person in the back. • As he bent down, and then tried to straighten back up he was shot three times in the back and died. I have never seen a better definition of an executive regulatory agency! I just finished reading all the OSP reports. THERE IS NO MENTION OF A GUN BEING FOUND ON LAVOY’S BODY! The shooters did NOT see a gun (just feared). A list of items removed from his body does not include a gun. No witness described seeing or finding a gun on Lavoy. When Lavoy’s body was moved a witness describes seeing one of the bullets that he had been shot with, perfectly mushroomed shaped, fall from him into the snow— but such careful observation did not see a gun. The first mention of the 9mm is Feb 8 fully 12 days later during a forensic analysis. Note: Other sources I deem credible report that LaVoy did own a 9mm, a gift from a family member. Whether it was the same gun or not, I do not know, but it may have been. The 9mm they eventually reported finding on his body reportedly was reported as stolen some two years ago. This is a not-atypical report from an innocent American citizen in Burns, Oregon. The Federal Invasion of Burns was, for all practical purposes, martial law. This should not be allowed in America. This is what was happening to rural residents in Harney County at the hands of the FBI. Thus far only the people of Burns have talked about how they were “terrorized”. Meanwhile….. in rural Harney County, the FBI and OSP were pointing assault rifles at citizens, patting them down, destroying their property (FBI flattened a rancher’s tires because they accidentally drove over their own spike strips while driving the rancher’s vehicle through a road block), throwing them to the ground and handcuffing them, making children and a pregnant women get out of their vehicle and searching them, the stories go on and on. All of this did not take place in close proximity to the refuge. A lot of this took place about 30 miles or more away from the refuge. Now, tell me WHO was “terrorized” and WHO the “terrorists” are!! Below is just one account of the locals going through road blocks, an audio recording. It is time to end the Federal occupation of over 700 million acres of land in twelve Western States from Arizona to Oregon, and from Alaska to California to Hawaii. Just as the Federal occupation of Southern States after the Civil War came to an end, it is now time to end the Federal occupation of Western States which began when they were admitted to the Union. The occupation of Southern States ended at about the same time that the occupation of Western States began almost 150 years ago. It is now time that the occupation of Western States comes to an end too. These lands should be returned to the States, the Counties and to the People. The Federal Government has a nasty little habit of hanging on to things a lot longer than it should. Please read and sign my petition to return these occupied Lands to State and local control. What started in Burns Oregon must be taken to twelve State Capitols and then on to Washington D.C. where Congress has the power to end this occupation of State land. 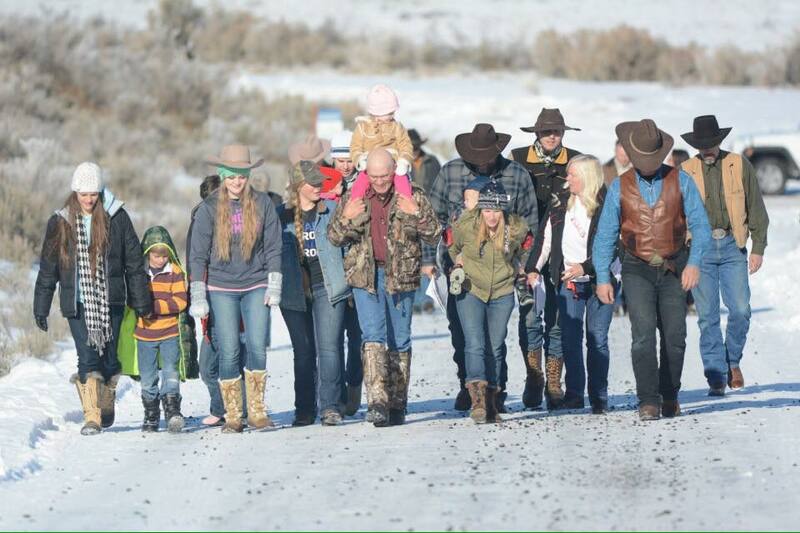 Stand with the Hammonds of Oregon and the Bundys of Nevada and with Lavoy Finicum of Arizona. New details have emerged that an agent with the FBI’s elite Hostage Rescue Team may have opened fire on Robert “LaVoy” Finicum, one of the central players in an anti-government standoff in Oregon, after Finicum’s truck crashed near a police roadblock. Several members of the FBI unit were present Jan. 26 when authorities attempted to stop two vehicles carrying leaders of the standoff away from their stronghold at a remote federal wildlife refuge. During the encounter, two Oregon state troopers shot and killed Finicum; eight other people were arrested. The five FBI agents have denied firing assault rifles during the incident. But in a recently released interview, an Oregon State Police officer told investigators that he spotted two copper-colored rifle casings near the spot where the FBI agents were standing. The Hostage Rescue Team has used copper- ­colored casings, former agents said; the Oregon state police use only silver-colored casings. The copper casings were never recovered…. The ongoing legal proceedings against the former occupiers of the Malheur National Wildlife Refuge have raised some interesting questions about the intersection of communications technology and the law. Arnold’s law firm has actively used social media and crowdsourcing for information to use in Bundy’s defense. The Malheur suits will be watched with interest by lawyers following the development of case law on the use of social media in trials. It will be instructive to see how the opposing attorneys’ arguments play out, and what precedents may be set for the use of social media in the future. THIS IS A VIDEO THAT WAS RECORDED AT ONE OF JOHN TRUDEL’S BOOK SIGNINGS FOR A TEA PARTY GROUP IN AZ IN APRIL 2016. This video discusses the January 2016 disaster in Burns, Oregon. The video and sound quality is not good. The night was long and the environment was noisy. We wanted John to come back and do a better video in a studio, but his other commitments made this impossible. Note: Technically the comments below are just accusations at this point, BUT THEY NEED TO BE FULLY INVESTIGATED. It is a sad commentary on the political divisions in America that many, including me, think the accusations made below might possibly be valid. Sadder, is that others will not care, even if they are proven to be true. CLIVEN BUNDY’S SON FORCED TO SIT IN HIS OWN WASTE WHILE IN THE CUSTODY OF THE FBI. During an interview with John B Wells, Mel Bundy’s wife tells of the horrific conditions her husband was forced to endure after he was arrested. Forty fully armed men came to his job site that day dressed as construction workers who never identified themselves as FBI, even while they were beating him. For almost two full days Mel Bundy was forced to sit in a room with no bathroom, covered in his own urine, feces, and vomit. During that time Mel Bundy was offered a slice of stale bread to sustain him. When they finally did bring him a meal on the third day, he was forced to eat it on the floor “like a dog” according to his wife. IS this what we have become? What does this say about us as a people? About our culture? Where is the outrage? This is an election year with one of the worse miscarriages of justice in our history and not one candidate — NOT ONE — will come to the defense of these men and women and demand that at the very least, they be treated humanely?!! Let this sink in — THEY BEAT HIM — LOCKED HIM IN A ROOM — WHERE HE SAT COVERED IN HIS OWN URINE — FECES & VOMIT — FOR TWO FULL DAYS. HE WAS NOT ALLOWED A SHOWER — HE WAS NOT ALLOWED CLEAN CLOTHING — HE WAS OFFERED A SLICE OF STALE BREAD TO EAT — AND WHEN THEY FINALLY DID ALLOW HIM FOOD HE WAS FORCED TO EAT ON THE FLOOR!! 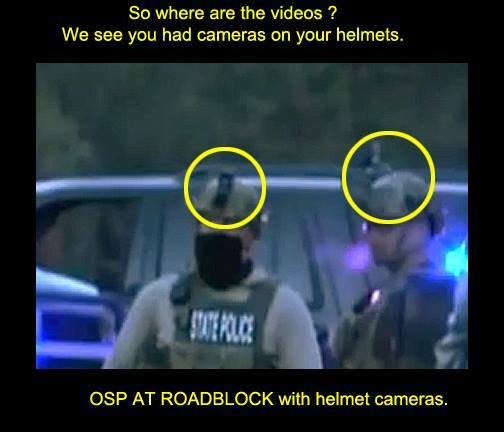 There is zero doubt regarding the murder of LaVoy Finicum that OSP and FBI HRT, set this up, a kill box. Due diligence, I AM a retired Oregon Police Officer, from two counties away. While from a grand jury standpoint, this murder was never going to see the inside of a court room for criminal charges, that’s just how police shootings work, I DO NOT AGREE with the white washing of Justice. In reviewing the Deschutes County Reports, I’ve never read such garbage. Specifically, Officer #1 stating all OSP SWAT had been called to HQ in Salem Or, and briefed on the “anti United Nations” position of Grant County and many Malheur County citizens, that there existed an anti-United Nations authority sentiment. United States of America. This is simply astounding. To think that our State Police were actually called in and briefed on what their political positions should be. Shot three times in The Back while maybe reaching for a gun. Listen I’m unaware of ANY situation in which the police can set a road block in a poorly placed location, on a curve, and leave I think the report said, 360 feet of roadway to stop a vehicle traveling at 70 mph. And THEN “shoot at the vehicle” because you were afraid for your life. Since when can the Police create a set of “Expedient Circumstances” and then use that created deadly situation to fire on a moving vehicle. Without consequences. Had LaVoy been a threat and intended to kill police officers, then ramming the hasty road block would have accomplished that quickly. LaVoy did a fantastic job of missing the road block and getting stopped WITHOUT, causing injury to the police. His actions demonstrated his intent to NOT INJURE others. HRT policing their brass. Concealing evidence. I’m appalled, and to recently learn that these same FBI HRT members are still actively on duty, in Langley, simply adds to the clear intent of this murder. Sadly I recognize that the FBI’s actions are a “Learned” behavior. We will eventually learn that the FBI have been taught/ instructed to recover their brass, and that this will not have been the first time FBI HRT has committed this crime of crime scene tampering. We will learn that this tactic is an ongoing event, that multiple crime scenes throughout the United States. I am appalled. I did 24/25 years and have never seen such madness, what has happened, is it recruitment issues, or is it training issues. We live in a small community, and even locally the city police are looking like storm troopers, vest, M4’s on calls. Many of my past associates privately agree that law enforcement is changing, evolving into something never intended. Sadly they’re trapped 20 years in and to reach retirement they must do 25 or until they are 55. They feel trapped, because they are trapped. In closing I would share this. I know many men who were sent to Burns Oregon to assist. I know some of the OSP SWAT members, and have argued my view of the Murder of LaVoy Finicum. While we were not in agreement, and, I’m sure, I damaged long relationships. I cannot stand by and NOT call this Murder exactly what it was. I cannot Speak up, in fact I feel I have a duty to step up and call this sad, sad event exactly what it is, a murder of a fellow US Citizen. I pity my fellow retired officers who clearly recognize what has happened, yet do zero about it. Saying nothing. Not standing up, Not speaking out especially as a retired, or active police officer, is excepting the breakdown of law enforcement within the US. Honesty, Integrity , Loyalty to We The People, IS what being a Police Officer is all about. In closing I would like to share this Pearl. About 14 years ago the SCOTUS, handed down a finding, a definition of how/ what police duties are. It goes something like this. The duty of the Police is to investigate, and arrest. SCOTUS, states that The Police have zero duty to protect citizens from harm or death. When I read this SCOTUS definition I was heartbroken, ” no duty to protect” WTF. In a class I attended the instructor clearly defined that finding to mean this. It is the duty of the Police to protect the infrastructure, from the people. Not the duty to protect the people from the infrastructure. Folks Please READ this part again, and again until you understand exactly how this game is rigged. LaVoy Finicum had become the de facto leader of a FREEDOM movement. A natural born leader, no bravado, no threats of violence, however he was a threat to the INFRASTRUCTURE, for that, he was murdered by the Oregon State Police. Have you all seen this Burns Documentary by Jerry DeLemus?? I’m really shocked it hasn’t been viral? It’s quality work. Quality investigative journalism done by Jerry DeLemus on Burns, Oregon. An eyewitness to what took place at the Malheur Wildlife Refuge in Oregon concerning those protesting the DC government’s unconstitutional usurpation of land has said that there was no standoff in Oregon. She added that she didn’t observe law enforcement or protestors treat one another as if they were frightened. It’s because their every move and words were being orchestrated, not just by Kate Brown’s office, but also from Washington, DC. Deb is right on, there was no standoff. The FBI stayed in town driving the citizens crazy and trying to figure out what law if any was broken. There weren’t any, just trumped up charges. And now a man is dead, because United States Citizens were protesting the double jeopardy, false imprisonment of the Hammonds. Our nation has been cursed the last seven years with a runaway government and they must be stopped. The Bundy wives get an unedited video with Channel 12 in Portland. In Oregon the prisoners, normal Americans who have harmed no one and are innocent until proven guilty, are being held without bail and in solitary confinement. They call it something more Politically Correct — segregation. The label is oddly ironic. For the first time since the Civil War, the right of innocent citizens to Habeas Corpus has been suspended. We don’t even do this for jihadists, but we are doing it for ranchers and reporters. President Abraham Lincoln suspended the writ in 1861, when he authorized his Civil War generals to arrest anyone they thought to be dangerous. In addition, Congress suspended it in 1863 to allow the Union army to hold accused persons temporarily until trial in the civilian courts. The Union army reportedly ignored the statute suspending the writ and conducted trials under Martial Law. Obama is doing this now to peaceful Americans who oppose his policies. This is right out of George Orwell: Doublespeak and illegal imprisonment. Definition: Doublespeak is language that’s intended to deceive or confuse people. What we are witnessing is not justice. It is selective enforcement, coupled with cruel and unusual punishment. This is tyranny. Not for anything citizens actually did, but for what they may have been thinking…. Oregon Republican League — Is the Obama DOJ arresting innocent people for thought crimes? Arrests are taking place of women who visited the Bundy Ranch. As I recall there were thousands who visited the Bundy Ranch. Wow. This Obama EO — not recent, and not yet imposed — sets a greatly expanded set of conditions for how the President of the United States can declare Martial Law and AND TAKE OVER ALL RESOURCES in the interests of national defense. Was Burns, Oregon a test run for this? I do not know. If it was, the Federal Government got away with it, and without much media notice. Yikes. Reporters are now being arrested in Oregon. FBI raid in John Day. NO WARRANTS! PHONES TAKEN FROM HE AND HIS WIFE BOTH. IS LES ZEITZ A PAID UNDERCOVER FBI INFORMANT? EMERY uncovered things and reported about Zeitz this week and remember last week Zeitz was thrown out of Sheriff Palmers by the court bailiff!! What information do they think Emery has??? Mike hit a nerve and it is a big one called Zeitz!!! Seems many locals who used to respect and believe in Zeitz are now hiding in embarrassment knowing him. Becky is safe at this time but she has no way of contacting anyone. THIS IS HORRIBLE.The committee of correspondence has been doing their due diligence and getting the truth out. COULD EMERY HAVE BEEN IN POSSESSION OF THAT BACK PACK? 6/18/2016 — THE REPORTS IN THE OREGONIAN AND ALL OVER THE MEDIA THUNDERED THAT THIS REPORTER (WHO WAS PROBABLY SET UP BY A CONFIDENTIAL INFORMANT OF THE FBI) HAD AN ILLEGAL MACHINE GUN. If so this is a major Federal Crime punishable by up to 20 years in prison. Fortunately for Mr. Emery all this was false, either a lie or a bungled investigation. He did not have a working machine gun. He had a broken, nonfunctional part from a machine gun. Owning such a part is entirely legal. They also made a big deal about this part having no serial number. The truth is that there is NO REQUIREMENT that machine guns have serial numbers on the barrels. In fact they are normally shipped with two barrels, as barrels can burn out quickly when firing full auto. Here is a correction to address (fix) a misunderstanding I had posted. The LaVoy group WAS going to meet with highly respected Sheriff Glenn Palmer. But Sheriff Palmer had no part in inviting them to the meeting. He was there, but left when he got news about the road block incident. “Sheriff Palmer was not planning to meet with LaVoy. Ammon, LaVoy and Ryan Payne were invited to speak that night by Tad Houpt, a local timber owner/businessman. The charges and “complaints” against Sheriff Palmer seem absurd to me, but it is what it is, and these are being shouted to the rooftops by the Portland Oregonian. One of their reporters, Les Zaitz, leads the witch-hunt. This seems insane to me. Signing a Constitution??? The meeting that Police Chief was so worried about was an open public meeting set up by local citizens. The ranchers and reporters coming to the meeting HAD NO CHARGES OR WARRANTS AGAINST THEM at the time. And the meeting in question never even happened because the ranchers were ambushed on the way to meeting. Their leader, LaVoy Finicum, was shot down and killed. The rest were detained. Most were then arrested, except for one girl, an 18 year old singer named Victoria Sharp. (Las Vegas, Nevada, May 10, 2016). Today, Cliven Bundy filed a complaint against U.S. District Court Judge Gloria Navarro, U.S. Senator Harry Reid, the son of Harry Reid, Rory Reid and President Barack Obama for allegedly violating his Sixth Amendment Right to Counsel and For Speedy Trial, Eighth Amendment Right Against Cruel and Unusual Punishment (Mr. Bundy is currently being held in solitary confinement), Second Amendment Right to Bear Arms in Self-Defense, and First Amendment Right to Assemble in Self-Defense. The complaint can be found at http://www.larryklayman.com. Cliven Bundy’s attorneys will discuss the complaint following the hearing at 10:00 a.m. on the courthouse steps. This is the Attorney who filed the lawsuit for Cliven Bundy and the other political prisoners. 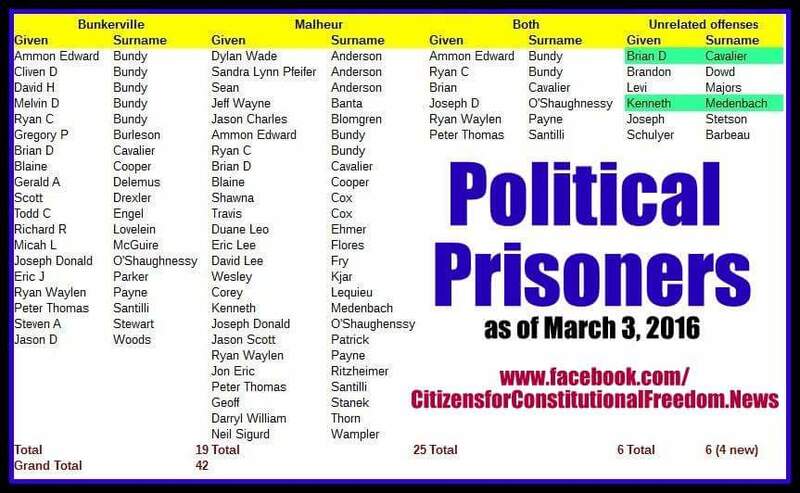 The Obama DOJ has been frantic to keep him from representing these political prisoners. They failed. Larry became so famous for fighting corruption in the government and the legal profession that the NBC hit drama series “West Wing” created a character after him: Harry Klaypool of Freedom Watch. His character was played by actor John Diehl. Note: IF YOU GO TO THE LINK ABOVE, THEY HAVE A BUTTON WHERE YOU CAN DONATE BY PAYPAL. No sheriff in Oregon has done more to stand up for the Constitution and the Second Amendment than Sheriff Glenn Palmer of Grant County. Sheriff Palmer traveled to Salem to oppose the debacle that is SB 941 and vowed he would not enforce this travesty against the people of his county. Time after time the Sheriff has defended liberty and followed his oath in spite of withering attacks by leftists and media hacks posing as “reporters.” Now it’s time for us to stand up for him. Outrageous and baseless accusations have been made against him as a result of the Harney County occupation. A 911 operator in John Day filed a false police report against him, and other law enforcement agencies have withheld critical information from him, possibly in violation of the law. John Day Police Chief Richard Gray has dredged up a 4 year old dispute over computer records. Sheriff Palmer deleted records from his office computer after discovering that there had been unauthorized access to it. Although the Sheriff kept hard copies, the computer files were deleted to protect persons whose information was being accessed. Now Gray is using this issue as part of a complaint against Palmer. As a result of numerous politically motivated complaints, the Department of Justice has opened an investigation on the Sheriff. We think it’s quite possible that some of the complainants could well find themselves facing criminal charges, but for now we are asking that you consider a donation to the legal expense fund that has been set up for him. It is our hope that this witch hunt ends soon and the Sheriff can go back to work for the people of Grant County. If that happens all donations will be returned to donors in accordance with ORS 244.221 on a pro rata share. What follows is a press release from the Trustee of the fund. Family, Friends and Supporters of Glenn Palmer, we are pleased to announce we have the legal expense trust fund in place and ready to receive your contributions. Contributions may be made in person at Old West Federal Credit Union where you may make a direct contribution to the trust fund, or you may mail me your contribution. Also I can receive the contribution in person. Sheriff Glenn Palmer established the Glenn E. Palmer Legal Expense Trust Fund by receiving written authorization of the Oregon Government Ethics Commission. Under Oregon law, any person may contribute moneys and in-kind assistance to Sheriff Palmer’s Trust Fund (with the exception of a principal campaign committee). Contributions will be used to defray legal expenses incurred by Sheriff Palmer in defending himself in an investigation brought by the Oregon Department of Justice and the Department of Public Safety Standards and Training, which investigation specifically relates to and arises from the course and scope of Sheriff Palmer’s duties as a public official. Contributions to Sheriff Palmer’s Trust Fund will not be used for any personal use. More information about Sheriff Palmer’s Trust Fund is available from the Trustee. Contributions may be received by the Trustee in person, by mail, or by deposit to the Trust Fund’s account at Old West Federal Credit Union. Bingo. Burns Oregon is a test run for Tyranny. Obama has suspended Habeas Corpus for U.S. citizens. This is how he is arresting ranchers and Americans all over the country. Obama may be able to arrest anyone he chooses to deem as “terrorists” by using the 2001 Patriot Act to bypass the Constitution. This is the “Martial Law” that has been rumored for years, and dismissed by the left as a tin hat conspiracy. This is apparently how ranchers, reporters, and women with cameras are now being arrested all over the country and held incommunicado without bail. Legal challenges to this have recently been filed in Nevada, with Obama, Harry Reid, and others named as defendants. This is what is behind the Burns Disaster. Thank you, Hillary. A couple of weeks ago, as the greatly anticipated press conference on the shooting of a rancher along a deserted stretch of highway in southeastern Oregon was about to unfold, tensions were rising. There were actually ran promo spots on radio and TV and whispers began all over social media in the couple days leading up to the conference, talking about the possibility of being invited to attend this special event where it would revealed to all, just what happened, and who’s responsible. One thing was for certain though, and was not in dispute; 54 year old LaVoy Finicum, a husband, a father, a former Marine, a rancher, a lover of liberty, who had never been in any trouble with the law his entire life, was dead. What we all wanted to know in addition to why was; who ordered it, and who carried it out. Most of us had seen, at different times, excerpts from the “official” video, taken from overhead by a drone (of unknown ownership), which we were told was “unedited” footage, only to later learn it was not. It was a video only, with no audio, poor positioning (often behind trees) obscuring a clear view of what was happening on the ground, yet even at that, it was horrifying to watch. That footage however was nothing compared to what was to come out just before the press conference; a film taken by Shawna Cox from the backseat of LaVoy’s pickup, with sound, and all the emotions of the five passengers in that truck, one of those an eighteen year old member of her family’s singing ensemble, on the way to a meeting where they would perform. When I watched it the first time in an attachment to an email sent to me, I was stunned. Even though I had already met with Shawna weeks earlier following her release from jail, and had taken her whole story down, I was totally unprepared for what I witnessed! I was on deadline that night, and I almost couldn’t continue to write, or even focus on the other stories and editing before me. The next morning a few visitors came by the office and I showed the Cox video over our computer monitor in the front office. Not a word was spoken until the nearly 12 minutes video was finished. Jaws dropped visibly as gasps of disgust could be heard. How could this happen? Not in America! Not for merely voicing political dissent about the policies of federal land management! Right then, someone said to me, “You know, I had no idea, really, what had happened over there. And a lot of our friends know even less.” So I made the decision, right then, to host a public event, and let the people see this and decide for themselves what it all means. I got in touch with the owner of Loggers Tap House, a local restaurant that had a big screen, and enough seating capacity to accommodate a good crowd. We picked a time that was before their normal business hours so as not to disrupt their normal clientele, and they offered to put together a special, no-host pancake breakfast for just $7 so they could make a little without charging room costs. It came together very smoothly, and we began getting the word out. It looked like everything was going along just fine; we were already getting lots of RSVPs so we could give the cook a headcount. That’s when we got our first call asking: “Why did you cancel the video presentation about LaVoy Finicum’s murder?” We just stood there dumbfounded and reassured her that we had done no such thing. And assured the caller it’s a go! After all that call came in Thursday night at about 5:00 pm and the event was scheduled for morning after next on Saturday, at 10:00 am. Sure enough I checked my e-mail, and the owners had cancelled our booking, with less than 36 hours to go! We emailed back and forth as to what had happened, and it came down to their being threatened with a boycott if they let us provide this information to the public. Now at this point, after recovering from the shock and the scramble required to change venues at the last hour, I was sickened for our friends at Loggers. This is the last thing they wanted. According to the owners, the group that organized the boycott, using social media, was Wives of Law Enforcement Officers. They were told if the video, which the Deschutes County Sheriff’s office released, were shown; they would encourage everyone they could to not eat in their restaurants! So much for the First Amendment, so much for free speech, and so much for an open public review of the investigation just released. It was very disturbing to watch this kind of attack being launched against a local business owner. Perhaps the most disturbing was the realization of how this attitude has permeated our society today. It’s coming up at political gatherings where people are showing up with the sole purpose to disrupt and intimidate those with whom they disagree. It comes up when someone doesn’t bake a cake, or chooses to state their faith position. The bottom line is; it is unfettered intolerance. But just disagreeing doesn’t go far enough for those with this mindset; they insist on theirs being the only permissible view. In the end we held the event at the Holiday Inn and made the presentation to a standing room only crowd. It was surprising how many people had not seen the footage. Most were aghast! And for good reason. There are many new, and many contradictory pieces of evidence coming out this week about FBI shots, first denied, and now in evidence. The story has made it to the Washington Post, and some believe there may be criminal charges before this is over. We will continue to cover this as it unfolds. One thing is for sure; pushing this tragedy behind closed doors is no way to restore confidence in a government that is sorely lacking in the faith and confidence of those they represent. And while we appreciate and support the Thin Blue Line, which was put in place to protect our rights, we want to be certain that we’re standing on the same side of that line. American ranchers are not the enemy. Editor’s Note: For those who missed this showing, we will be showing the video footage and some additional coverage again in a public meeting sometime after the Easter holiday. Watch for announcement. As of July 2016, this has not happened, nor have the OSP records of this shooting been made public. Until I started routinely flying to LA to visit my incarcerated friends, I didn’t realize how often the other passengers ask, “What are you headed to *insert-destination-here* for?” as a means of making small talk. Whelp. You picked the wrong guy for small talk. I’m gonna lay a heavy story on you, so buckle up, we’ve got two hours. It’s funny the response you get when you tell someone you’re headed to LA to visit your federally incarcerated friends. I can imagine the awkward position it puts the conversation initiator in, heck, I’m not sure what I would do with that statement if the roles were reversed. One guy just blurted out, “I almost went to prison once…” then proceeded to tell me about his run-in with the Army’s MP division in 1966. A then nineteen year old kid, he got caught with a joint and, in order to avoid a court-martial and 6 months in the stockade, volunteered to be one of the first shipped over to Vietnam. His CO thought that sounded like a fair deal, so he shipped out and spent ten months in ‘Nam as a paratrooper. I asked if he thought that he’d made a good trade, and he was certain that he had. It sure makes for an interesting conversation, no doubt. Some people physically recoil while saying, “That’s terrible.” Sometimes I leave it at that, and other times I launch into my oft repeated diatribe. Others lean in and say, “Do you mind if I ask why?” and I proceed to regale them with this tale of the American dream, federal malfeasance, extreme media bias and/or incompetence, ineffective counsel, and a blatantly egregious abuse of anti-terrorism legislation. Two dear friends of mine —salt of the earth ranchers, ages 74 and 47— were convicted under the Antiterrorism and Effective Death Penalty Act of 1996 (AEDPA) for “maliciously” setting fire to under 140 acres of Federally administrated range ground —ground which they owned the grazing rights to— carrying a mandatory minimum sentence of 5 years. One fire, a preemptive, defensive backfire burned around one acre, the other, a prescribed fire that trespassed on about 138 acres. Contrary to media coverage, and the claims of the prosecution, both fires were started on the Hammonds’ private ground to protect and enhance the vegetation, and both had verbal authorization from BLM personnel. Due to long standing animosity between the Hammonds and various federal employees —partially stemming from the Hammonds filing a claim on, an ultimately obtaining, a water right that the Federal government had once laid claim to but failed to prove beneficial use of— the Hammonds were targeted, and made an example of. The federal prosecutor went on to appeal the sentence, and the 9th Circuit Court overturned the sentence, sending them back to prison for the remainder of the 5 year mandatory minimum – citing the fact that the Supreme Court “has upheld far tougher sentences for less serious or, at the very least, comparable offenses.” Citing “a sentence of fifty years to life under California’s three-strikes law for stealing nine videotapes,” “a sentence of twenty-five years to life under California’s three-strikes law for the theft of three golf clubs,” “a forty-year sentence for possession of nine ounces of marijuana with the intent to distribute,” and “a life sentence under Texas’s recidivist statute for obtaining $120.75 by false pretenses.” I don’t know about you, but I’m of the school where two (or, in this case, multiple) wrongs don’t make a right. Nine out of ten people that I’ve spoken with about this subject, liberal or conservative, rich or poor, are astounded that something so unjust, so unconstitutional, so un-American, could happen in this country. The more often I visit the federal correctional facility, and slowly become acquainted with some of the inmates, their families, and their stories, the more painfully aware I am that this IS happening, and it is happening a much larger scale than I ever could have fathomed. It’s scary to delve in and investigate these things, scary because it undermines your whole perception of reality, of security. When I became aware of some of the inmates my friends were becoming acquainted with, I unintentionally noticed their names (detailed on a small patch on every shirt and the back pocket of every pair of slacks). When I returned home, I couldn’t get them off my mind, so I began to investigate. Thank you, Google. A plethora of news articles and court transcripts are available with a few key strokes and a click of the mouse. Using this information, discernment, and first hand accounts, I have tried to be overtly objective about each individual. In my opinion, even assuming that each inmate is guilty, the majority of the federally imposed repercussions directly related to the inmates’ actions vastly outweigh the severity of their crimes. The cost to the individuals, their families, and SOCIETY is often quite disproportionate to the crime. According to the Federal Register (https://federalregister.gov/a/2015-05437), for fiscal year 2014, the average cost of incarceration for Federal inmates in was $30,619.85 ($83.89 per day). To keep two men imprisoned for the mandatory minimum of five years, for the heinous crime of inadvertently burning approximately $100 worth of Federally administrated land, it is going to cost American taxpayers over $300,000. And that’s a conservative estimate, we know costs are only going to rise. This is just one cost associated with this sentence. Another? Although Federal prisons are now called “correctional facilities,” they are still primarily punitive. In this context, Dictionary.com defines correction as: punishment intended to reform, improve, or rehabilitate; chastisement; reproof. I see no restoration or rehabilitation happening, at least not as a result of anything that the Bureau of Prisons (BOP) is doing. The only reformation I’ve witnessed is due solely to the will of the inmate and the grace of God. Anyone who’s ever made a New Year’s resolution knows how very hard it is to permanently change one’s behavior, and these men are doing it under extremely unhealthy emotional circumstances. WOW. THREE DEAD NURSES FROM BURNS OREGON AFTER LAVOY DEATH??? Quick bit of news y’all may want to discuss in Harney county. 3 DEAD NURSES WHO WORKED AT THE HOSPITAL WHEN LAVOY WAS ASSASSINATED. 2 suicides (wonder how? Jody Batt went missing then was found with a gunshot wound) and so far the third found foaming at the mouth dead in her home. Kristi Harvey, second one we know about, was just 39, and on the hospital bargaining committee? ..WAKE UP! Do you really think the events around Harney are over? If you are one who knows anything or saw anything you may want to relocate, we’ve tried to warn y’all. DAVE WARD BETTER WATCH HIS BACK as we believe he has been used by agencies and they leave damage in their wake when done with the people who help them..
and what about Ken Harvey from Seneca found bleeding from the mouth, ruled natural death? He was thought to be in the area when lavoy was murdered helping a friend buying a snow mobile at that very time, but no one will confirm or deny whether he was present, but we know he’s dead, Oh it was Jay Ellis who was selling it from what we’ve heard, so maybe he can shed light on Harvey?. .back to fishing, carry on. The Uranium One deal is what underlies the Burns Disaster. Thanks, Hillary. [dcquiz] Frank Giustra, a major mining investor in Canada and owner of UrAsia, won a landmark uranium deal in Kazakhstan just days after visiting with Mr. Clinton, reports the New York Times. The two men boarded Mr. Giustra’s private jet to Kazakhstan where they met with the country’s autocratic president, Nursultan A. Nazarbayev. Mr. Clinton, in addition to helping Giustra, undermined American foreign policy by expressing his personal support for Nazarbayev’s desire to head an international elections monitory group, reports the New York Times. 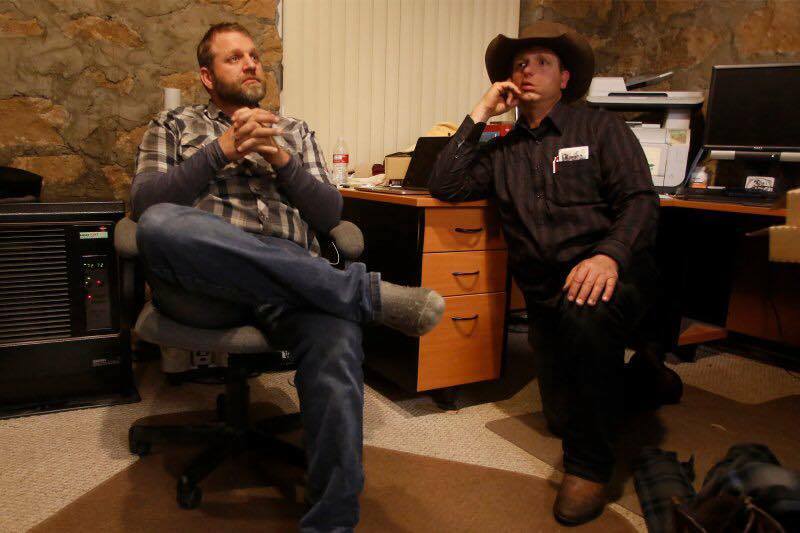 Inside information on FBI coverup about Burns and Bundy Ranch incidents. She asserts the FBI has NO information that any crimes were committed in Nevada at the Bundy Ranch, and makes a good case that ranchers are being intimidated into confessing for crimes they did not commit in the hope of being released to see their families. PORTLAND, Ore. (AP) — Oregon standoff defendant Ryan Bundy’s confrontation with sheriff’s deputies at a Portland jail stemmed from his fear that a bullet lodged in his shoulder would be surgically removed without his consent, Ammon Bundy said in a recorded message posted to the Bundy Ranch Facebook page. In the clip posted late Tuesday, the jailed standoff leader said he was awakened early Tuesday by pounding on his cell door. It was his brother, Ryan, saying U.S. marshals were taking him to the hospital for a surgical procedure. “He was calm but firm that they do not have consent to take the bullet out of his arm,” Bundy said. Some sort of altercation followed. Multnomah County jail spokesman Capt. Steve Alexander said Tuesday that Ryan Bundy argued with a sergeant and was taken to the ground. Ammon Bundy said the jailers used unnecessary force. Alexander said he didn’t know where marshals took Bundy after the scuffle, but he was placed under higher security when he returned later in the day. Federal prosecutors declined comment on his travels or Bundy’s claim about the bullet. Ammon Bundy said investigators want the bullet because it was fired during the Jan. 26 traffic stop that ended with the fatal shooting of Robert “LaVoy” Finicum, the Arizona rancher who emerged as a spokesman during the weeks-long occupation of the Malheur National Wildlife Refuge in southeast Oregon. Oregon State Police troopers fired the rounds that killed Finicum, a shooting deemed justified because he failed to heed their commands and reached for his weapon. As they looked into how many shots were fired and by whom, the investigators found a round in the roof of Finicum’s truck. Ryan Bundy was among those inside the vehicle. The investigators discovered members of an FBI hostage rescue team who were at the scene failed to disclose they fired two rounds that missed Finicum. Prosecutors revealed earlier this summer that the investigation of the FBI agents is now before a grand jury. Ammon Bundy said his brother is willing to have the bullet removed, but doesn’t want the government in charge of handling the evidence. Gerri Badden, spokeswoman for the U.S. attorney’s office in Oregon, said prosecutors can’t comment on any matter in the pending investigation. The Bundy brothers and six others are scheduled to stand trial next month on charges they conspired to intimidate Interior Department employees from doing their jobs at the refuge. The armed group wanted the government to relinquish control of public lands and free two local ranchers imprisoned for setting fires. Ten defendants have pleaded guilty and another eight are scheduled to go on trial in 2017. Testimony from Ryan Bundy about his Portland Beat Down. Ryan is back in solitary confinement (they call it “sequestered” — a more politically correct word) and only out 15 minutes every 24 hours to speak with anyone. Ryan gives more insight into the “coincidental” deaths of the three nurses from Burns following the “standoff.” No wonder people are in fear for their lives. More — Looks like the Bundy boys will be punished for getting the above video out. Ryan is already “sequested” (back in solitary confinement, only allowed out 15 minutes a day), and they are about to do the same to his brother Ammon. “Last Tuesday shortly after Ryan was drug out of jail to his “supposed hearing” that never happened, Ammon’s attorney flew out to Portland. When he arrived Ammon met with him for a few hours. While he was away from his cell the guards at the jail turned his cell upside down and ripped his pictures off the wall. Upon arriving back to his cell to see the mess, he was informed that he was written up for contraband. What did they find? A small packet of salt and pepper that you can order off of commissary. He was supposed to go before a jail employee tomorrow to see if he will go into solitary for his punishment. The jail decided they would do it today instead. Before there was Burns (2016), there was the Bundy Ranch (in Nevada) incident in 2014. A short video summary of what happened there and why. It’s not at all like what you see reported in the news media. Thank for showing the truth and not the government propaganda. •Jason Blomgren (Joker J), pleaded guilty to a federal conspiracy charge. •Brian Cavalier (Booda), pleaded guilty to a federal conspiracy charge and a charge of possessing firearms or dangerous weapons in a federal facility. •Blaine Cooper, pleaded guilty to a federal conspiracy charge. •Travis Cox, pleaded guilty to a federal conspiracy charge. •Eric Flores, pleaded guilty to a federal conspiracy charge. •Corey Lequieu, pleaded guilty to a federal conspiracy charge. •Ryan Payne, pleaded guilty to a federal conspiracy charge. •Geoffrey Stanek, pleaded guilty to a federal conspiracy charge. Dear Lord, I am so angry I could spit, forgive me. Dear Abba Father, repay the evil for evil, that we cannot. Vengeance is yours Father, but we lean on you for justice, for only you can mete it out. Our Lord God, have mercy on these dear men, who stood for the Hammond’s. And stop the evil of this federal government. Expose their evil in broad daylight and measure to them ten fold the damage they have done to my fellow men. IT’S ABOUT HILLARY’S URANIUM — Hillary to Clinton Foundation –> to Uranium One –> A Canadian company which is now owned by Russia. Under the Kerry/Obama Iran deal, this uranium can be resold to IRAN and used for nuclear weapons to attack America. The Obama appointed Federal Judge who is trying the Ranchers who protested in Burns Oregon gets a piece of the action through investments. She, therefore, should have been forced to recuse herself. This is a video of several excerpts of a whistleblower presentation given today on the steps of City Hall in Portland, OR. Laz, AKA Lazaro Ecenarro, and Shawna Cox presented documents laying out the ties of corruption between the Hammond, Bundy and Malheur lands and all levels of State and Federal agencies and agents. The entire presentation is an hour long, so here’s a few of the hot points. THIS is why they have come down so hard on the Hammonds and the Bundys and the other brave Americans standing and being persecuted for the rights of all of us. New Wikileaks emails expand on the connections to the Clintons, Uranium 1 and Russia and China. Judge Anna Brown is shown to have relationships with investments that profit from the transactions related to the land grabs and sell offs in Oregon and the Western states. The “Maxine” Laz refers to is Maxine Bernstein, reporter for The Oregonian. Two Great Americans were far ahead of the pack for Oregon’s person of the year 2016. The winner was a Police Officer who died in the line of duty. Update: Jason Goodding, the Seaside police sergeant who was killed in the line of duty, is our 2016 Oregon Person of the Year. Look for a follow-up story coming Saturday, Dec. 24. Runner up was Ammon Bundy. Everyone else was low single digits. Our corrupt Governor Kate’s tally is below. Kate has blood on her hands from the #Finicum killing, and this will likely be provable as soon as all the OSP records are made public AS IS OVERDUE AND REQUIRED BY LAW. Anna Brown, the leftist judge, got an even lower rating. She presided over what is likely to be someday noted as the most important and worst reported trial of the early 21st century, right down to tasering and assaulting the defense attorney (Mumford) IN THE COURTROOM because he dared to argue that his clients, just acquitted of all charges, must be released. The Bundys were NOT released. This trial resembled those conducted under Stalin, thought crimes and all, except that the jury found all (so far) to be “not guilty,” much to Anna’s dismay. POSTED ON 2/16/2017 — as trials continue both in Oregon and Nevada, here is a video showing some of the items that Federal Prosecutors are trying hardest to keep from seeing the light of day (along with, of course, the Oregon State Police records of the LaVoy Finicum shooting — which is now potentially, at best, wrongful death, and, at worse, premeditated murder). THIS IS A HUGE FILE OF DOCUMENTS, INCLUDING LEGAL DOCUMENTS ABOUT THE BURNS INCIDENT. It is worth reading and saving.